Need a door to go in front of another door? Adding this bracket system allows the doors to bi-pass one another. For doors up to 1 ¾” thick. One bracket per mounting hole. Simply increase your header above our standard kit and install. Available in Black, Painted Bronze and Clear Coat. 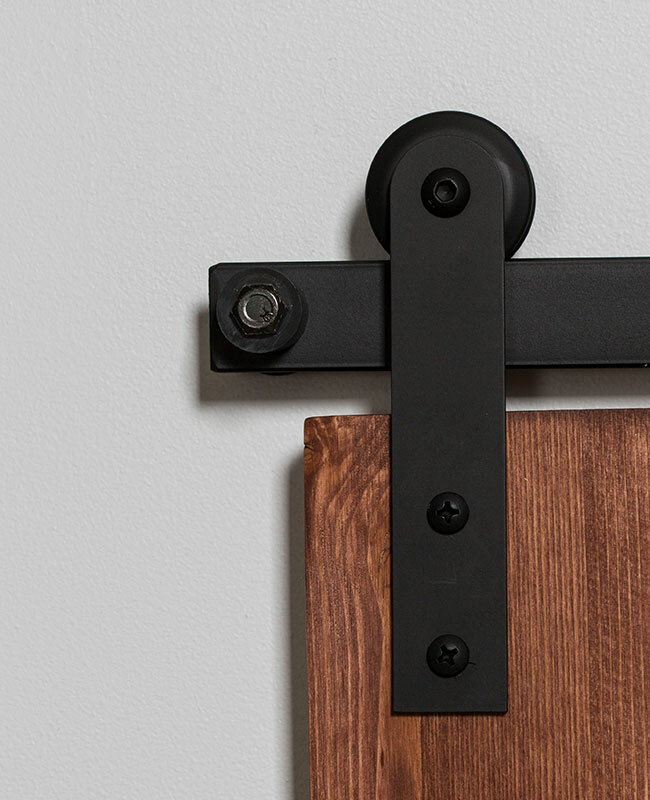 Designed to remove the need to mortise cut along the bottom of the door. It cradles the bottom of the door for vertical wall alignment. Track mounted, sturdy stop with cushion to quiet the close. Fixed on the end track mounting hole. 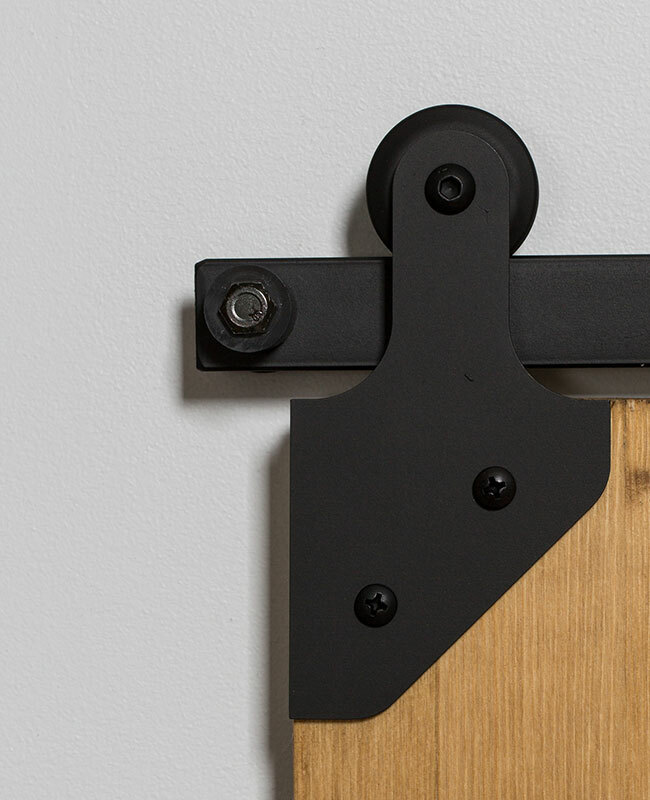 Low profile track stop that provides flexibility in door stop placement. 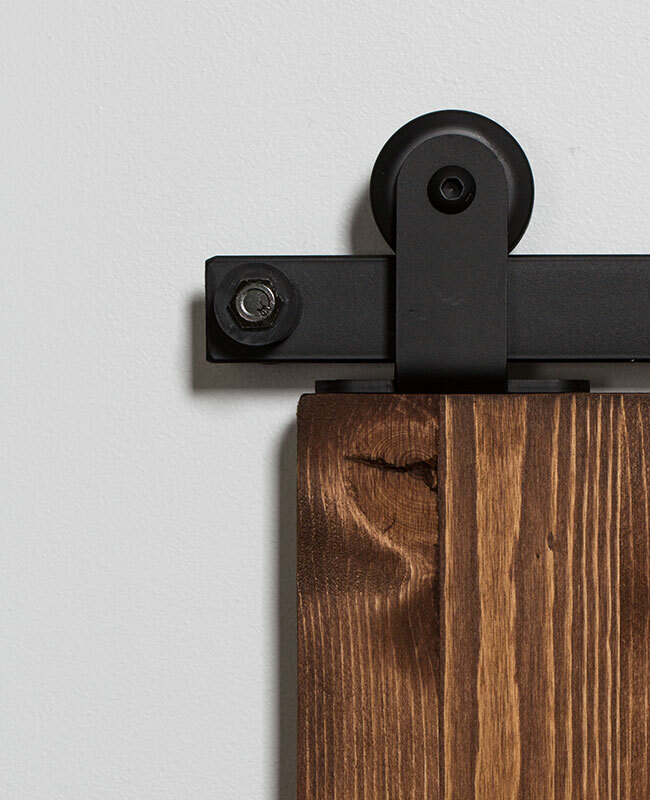 Adjusts up to 1” of movement and can be rotated for more range. Designed to also work with bi-pass hardware. Available in all finishes. Designed to guarantee your door stops exactly where you need it to. Simply slide one on from either end, position where you want your door to stop, then secure it down with the hex key/set screws. Add the hole inserts once hardware is in place and you’re done! These also work great with bi-passing/bi-parting. Bracket used to hold two ends of track together for precise alignment. Available in all finishes. Fixed on top of door, hidden behind hanger strap, to keep door on track. Available in Black. Concealed bottom floor guide to secure door. Floor mounted. 3 ½”, 4 ½” and 6” lengths. One per spacer. Available in Black Oxide, Zinc Oxide and Stainless. Flange against wall and behind track. Available in different sizes and in colors similar to standard finishes. Designed to accommodate situations where different space requirements between door and wall are affected by door thickness, baseboard/casing thickness or other adjustment needs. Two sizes. Small - 1 1/8" to 1 7/8" allows for 3/4" of adjustment. Large - 1 3/4" to 3" allows for 1 1/4" of adjustment.